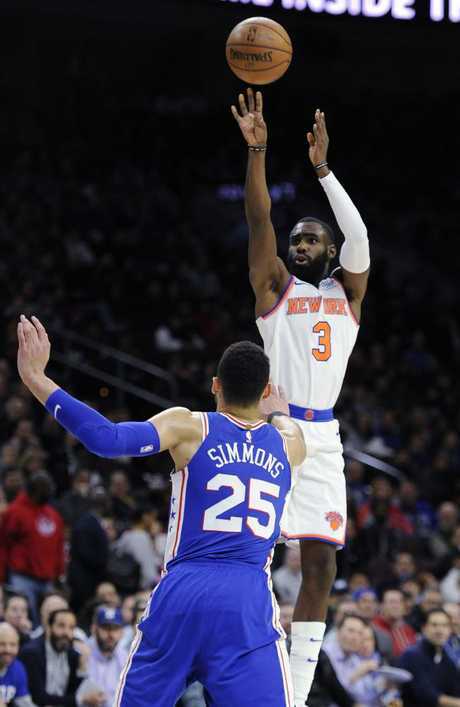 BEN Simmons laid the groundwork before TJ McConnell finished the job as Philadelphia stretched its winning streak to four with a 108-92 win against the New York Knicks on Tuesday. Philly's point guards combined for 23 points, 17 assists, 16 rebounds, 10 steals and three blocks as they moved to a 29-25 record and into seventh place in the Eastern Conference. The 76ers now have a three-game gap on ninth-placed Detroit, which dropped to 27-29 with a defeat against New Orleans, as it looks to secure a return to the playoffs. Simmons (13 points on 6/8 shooting, six assists, six rebounds, four steals, three blocks) was absolutely cooking in the first quarter as he made a mockery of New York's decision to insert Lance Thomas into its starting line-up as it looked for a bigger body to slow down the oversized Aussie point guard. He hit a deft jump hook to open his account before outpositioning Thomas for a dunk under the basket. The 21-year-old then turned provider, hitting Dario Saric for a three and a fast break drunk before threading a ridiculous pass to Trevor Booker for another slam. He had three steals in the first 10 minutes of the game as Philly led 31-21 at the first break. Saric had a 16-point first half as Simmons took his stat line to seven points, four rebounds, three assists, four steals and two blocks. But Courtney Lee - who responded to be being benched for Thomas with a team-high 13 first half points - Michael Beasley and Enes Kanter led the Knicks back into the game as the visitors closed to 57-55 at halftime. 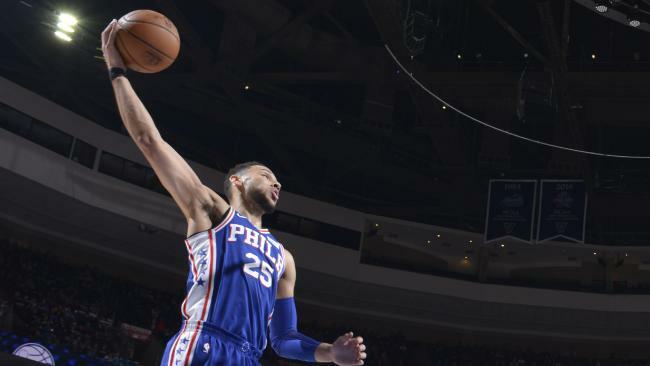 Simmons went back to scoring the ball in the third, hitting a jumper and then following a breakaway slam with a shimmy for the crowd as Philadelphia pushed back out to a 73-64 lead halfway through the quarter. The Knicks responded with a 9-0 run to tie the score before Robert Covington took over, following a long three with a three-point play and a dunk on Beasley as Philly led 86-79 with a quarter to play. Simmons played a support role to back up point guard TJ McConnell as the game wore on. McConnell had eight points, eight rebounds, eight assists and five steals as Philly pushed out to a 94-79 advantage with 8:34 remaining in the game. McConnell's 11th assist - on Saric's fourth triple - made it 104-86 with 4:23 on the clock as the Sixers shut the door. McConnell made a pull-up jump shot and then pulled down a defensive rebound to record his first career triple double as it finished 108-92. Simmons has another assist target after the 76ers signed veteran three-point specialist Marco Belinelli, whose contract was bought out by the Atlanta Hawks. Philadelphia announced the move on Monday ahead of the matchup with the Knicks. Belinelli was averaging 11.4 points in 23.3 minutes per game with the Hawks, who bought him out to allow him to join a contending team. The 31-year-old said he chose Philadelphia over Oklahoma City, Toronto, Milwaukee and Portland largely because he believes the 76ers are a team on the rise and wants to help their playoff push. He's also looking forward to playing alongside Simmons and All-Star Joel Embiid. "I trust the process," Belinelli said. "I was lucky to watch a couple of games. They play real well together on offence and defence. I want to help this team make a run. I'm really happy." Philadelphia coach Brett Brown said it shows how far the team has come that a player would choose the 76ers. "That's a statement for the program," he said. An 11-year veteran, Belinelli has made 945 three-pointers in his career, connecting on 37.7 per cent of his attempts from beyond the arc. "He's a shotmaker," Brown said. Belinelli didn't feature against the Knicks, as he admitted it would take him some time to get comfortable in the new system. The Sixers are the ninth team for the Italian, who had one of his best seasons in 2013-14 with San Antonio, when he made 43 per cent of his three-point attempts and helped the Spurs to the NBA title. He also won the three-point contest at All-Star Weekend that year.